This video describes how to fold a fantastic money origami model designed by Dominik Meißner. It resembles a baby buggy or a pram. You can fold it from most currencies, such as US dollars, Great British pounds, or Euros, or of course from any rectangle that has an aspect ratio of about 1 by 2. Dominik kindly gave me permission to make this video accessible to you. It's the perfect fold if you're thinking of giving a money present for a baby shower, the birth of a little one, or as a congratulation for the announcement of a pregnancy. This present is soo nice. Unfortunately I didn't succeed in it. It was too difficult folding the Sun-protecting Part. Totally adorable. I love origami for cards and invitations, even though it can be a lot of work. If you just have an intimate gathering though (or you're just giving money as a gift as this suggests), you can get through a bunch of these in an hour. Thanks for this video! I just followed it step by step (with a lot of pausing) and made one for a friends baby shower. I really appreciated all the detailed instructions about the differences between money and paper since I didn't have the time to do one with paper first and I did get a usable one out of a bill on my first try. It is not my first attempt with money origami, but it is my first try at something this complex. I really appreciate both Dominik making the instructions available and Sara's expertise walking me through it. thanks for this detailed instruction video for the baby buggy. 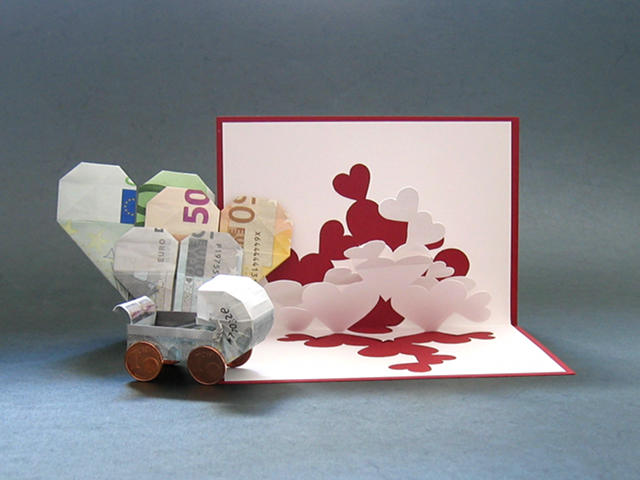 I could follow it well and succeeded in folding the buggy from a Euro bill. I would also love to fold the baby that can be found in Dominik's diagrams, but since I am not an experienced origami artist, I cannot understand those. I would very much appreciate a video on that, maybe you help me here?